Humanity. 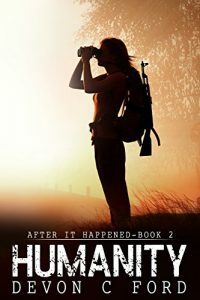 This is the second book in the After It Happened series and to start out, you will notice that this review is really soon after I just read the first one. I don’t claim to be a fast reader, even though I have read 300 page books in a couple sittings if it is engaging enough, but these books in this series is really more of a novella each. This one is only 192 pages and quite honesty can be read in a single sitting. To be brief, Ford continues to expand the retinue of characters in this post apocalyptic adventure. Also note that I did not physically read this book. I am an avid audible fan and listen to most of my books as I spend a good amount of my time in my car driving to work. See my disclosures page to learn more about that bit of things. Audible has this entire series available in three items where they are set in two “books” per volume. It is actually a nice way to purchase them and it actually seems to have the story flow quite nice. Humanity. To start out, you will notice that this review is really soon after I just read the first one. I don’t claim to be a fast reader, even though I have read 300 page books in a couple sittings if it is engaging enough, but these books in this series is really more of a novella each. This one is only 192 pages and quite honesty can be read in a single sitting. To be brief, Ford continues to expand the retinue of characters in this post apocalyptic adventure. One of the things that I would like to point out is that Ford does no seem to write for scholarly types. There are problems with his tense (hell even I am tense when I write) and his overuse of old English slang might grind on people. It is also not commonly know that he self published this first few books in this series so punctuation is a bit off. Only because I went back to read after I listened to the whole series did I see that. R.C. Bray who did the narration did an excellent job with either fixing or ignoring any errors there. What I found most refreshing is lack of zombies. Why does everyone need to turn into zombies in all the other apocalyptic books? This book does continue with the virus being the main source of the problem though. Contrary to what some people thought, that old English bits seemed to keep me more interested in the slower parts of the book. Ford’s character development in this second book was much better showing the reasons for actions taken by the characters in this dystopian society. It also showed that people will be people. After the shock of the initial change, the morality of the groups came into play. The sick minds and power mongering that is typical in people, and mostly male came out for all to see. Being a male I both hate the fact that Ford does this, and hate more that he is accurate. All of these things come together to make a very readable book. You should be able to zip through it pretty fast and still have time in the weekend to mow the lawn and sip on a beer.